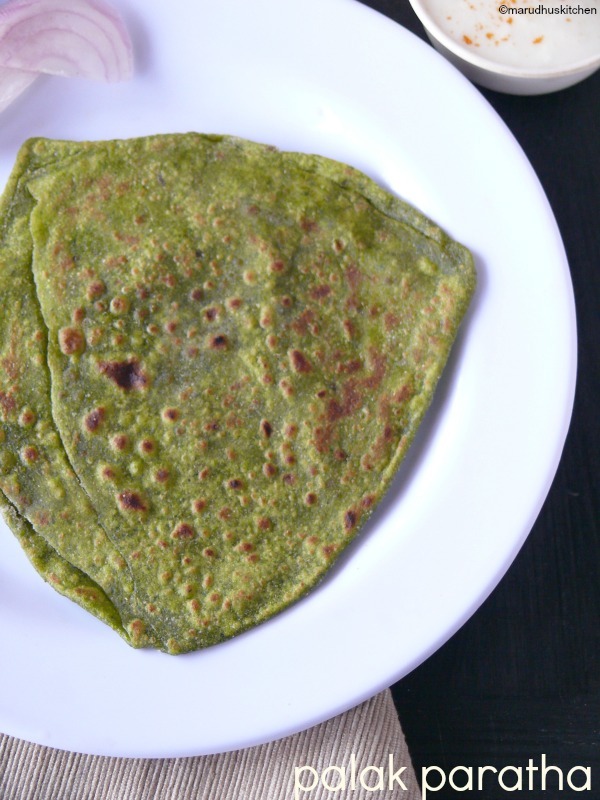 This spinach chapati recipe is a comforting alternative to chapatis or paratha’s that we make regularly. It’s highly rich in all the vitamins like A,K,E and C. Its always better to blanch these spinach before making any recipe so that all the raw smell and if any pesticides used will get washed out.More importantly we give a rapid boil to bring out the natural sweetish taste of this spinach. Don’t expose by boiling spinach for long time as all the nutrients and colour will be lost.These spinach chapati recipe is not only tasty but it’s very easy to make without any confusion.Any kind of simple raita will greatly match as a perfect side-dish. Moreover these can be made as simple chappati’s or as paratha’s as I have! giving a triangular shape. 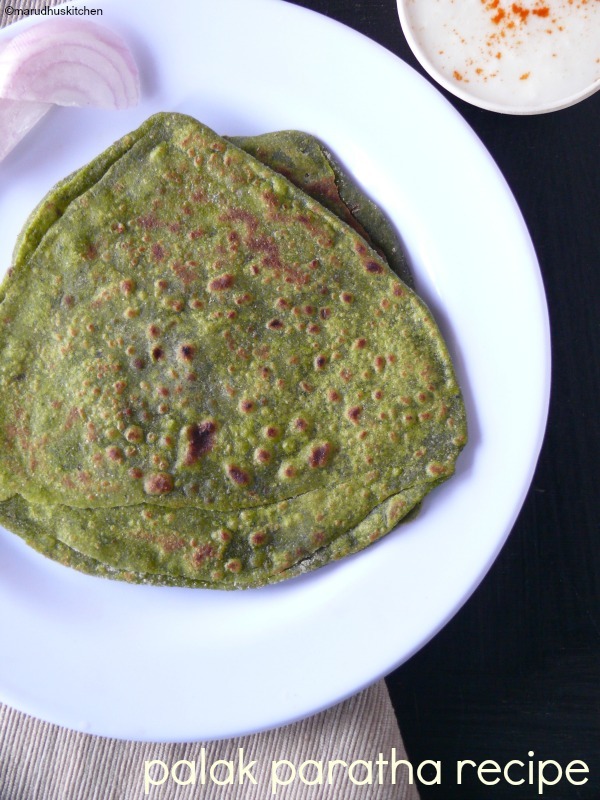 Sure,try these spinach chapati recipe and you will definitely like it. 1.Wash palak thoroughly and in-between heat water in a vessel. 2.When its boiling add these greens stir in all for a minute and it will shrink quickly. 3.Don’t leave for long drain it and shower it with tap water or transfer to a cold water containing vessel and drain. 4.Take this drained leaves in a mixer,add chilli powder,garlic,salt for spinach and cumin. 5.Grind to a paste and keep ready. 6.Now take flour in a broad vessel and add this puree with needed salt for the dough. 7.Make a smooth and soft dough by adding a tsp of oil and needed water as we do for normal chapati. 8.Should knead the dough nicely so that we get a soft dough. 9.Rest the dough by closing with a lid for 20 minutes. 10.Now heat a pan and start rolling the paratha’s. 11.Take a ball and dust it in flour mixture and roll it into circle. 12.Then smear with flour oil mixture and fold into triangles smearing each side with the mixture. 13. Then again roll it to triangle shapes and put it on the hot tava. 14.Cook both sides nicely by adding oil till it is well cooked. 15.Can serve it with simple raita. Wash palak thoroughly and in-between heat water in a vessel. When its boiling add these greens stir in all for a minute and it will shrink quickly. Don’t leave for long drain it and shower it with tap water or transfer to a cold water containing vessel and drain. Take this drained leaves in a mixer,add chilli powder,garlic,salt for spinach and cumin. Grind to a paste and keep ready. Now take flour in a broad vessel and add this puree with needed salt for the dough. Make a smooth and soft dough by adding a tsp of oil and needed water as we do for normal chapati. Should knead the dough nicely so that we get a soft dough. Rest the dough by closing with a lid for 20 minutes. Now heat a pan and start rolling the paratha’s. Take a ball and dust it in flour mixture and roll it into circle. Then smear with flour oil mixture and fold into triangles smearing each side with the mixture. Then again roll it to triangle shapes and put it on the hot tava. Cook both sides nicely by adding oil till it is well cooked. Can serve it with simple raita. Blanching part is important so see to that the colour of the palak is maintained. Don’t over cook and show immediately in cold water so that it stops cooking. This can be rolled as simple chapati shapes or the above triangle shaped parathas. Water from the palak is more so when making dough pour water with caution.